Future Derby Winner? Possible or Impazible? Home / News / Future Derby Winner? Possible or Impazible? Your mission, should you choose to accept it, is to determine if Mission Impazible is a legitimate 2010 Kentucky Derby contender. 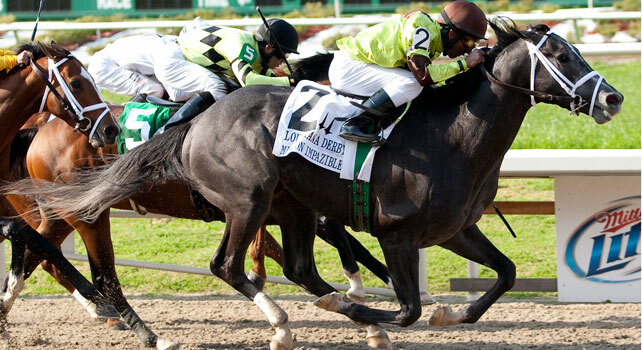 His victory in the Louisiana Derby (G-2) earned him a berth in the Kentucky Derby, but will that mission prove to be impossible or does he have what it takes to cross the finish line first? The dark gray colt won at first asking as a precocious two year old in April 2009. Coming back in just two weeks, he flashed his potential finishing a credible third in the Kentucky Juvenile Stakes (G-3), only 2 ¾ lengths behind the winner. Unfortunately, a knee injury sidelined Mission Impazible for the rest of the 2009 racing season. In early January, the talented colt made his first start in over eight months. He finished second by a short head, traveling six furlongs over a sloppy track at Gulfstream Park, earning a lifetime best BRIS Speed Figure of 104. Mission Impazible may have regressed slightly in the Southwest Stakes (G-3) at Oaklawn Park, running an even fourth around the track behind the pace setting Conveyance, but that race set him up to move forward in his next start in the Louisiana Derby. In the Grade 2 Derby prep, he broke sharply on the lead, but rated kindly just off of the pace for his jockey Rajiv Maragh. Swinging to the outside, Mission Impazible displayed a good turn of foot to catch, and then edge away from the leaders by ¾ a length in a final time of 1:50.32 over the fast track. Mission Impazible (Unbridled’s Song – La Paz, by Hold Your Peace) receives his pretty gray coat from his sire, Unbridled’s Song. The imposing 17 hand high stallion won the Breeders’ Cup Juvenile, the Florida Derby and Wood Memorial. He was the favorite in the 1996 Kentucky Derby, but developed a quarter crack and finished sixth in the race behind Grindstone, another son of Unbridled. Unbridled’s Song (Unbridled – Trolly Song, by Caro) is a son of Kentucky Derby winner Unbridled and his damsire Caro, from whom he received his gray coloring, gave us Kentucky Derby winner Winning Colors. Unbridled’s Song has produced four graded stakes winners at 1 ¼ miles over dirt, including Octave, Political Force and a listed stakes winner. He is quite capable of siring a Classic winner and has also produced 2010 Triple Crown nominee Winslow Homer. La Paz (Hold Your Peace – Classy Craft, by Crafty Drone) the dam of Mission Impazible, won four of five starts as a juvenile. The skilled mare won five of 15 starts in dirt sprints and finished in the money seven other times. She also won three of 11 starts on turf. Overall, La Paz is a multiple stakes winner who was in the money 20 of 26 starts. She is a half sister to three stakes winners, all dirt sprinters mainly in Arizona. As a broodmare, La Paz produced Mission Impazible’s half brother, Grade 2 winning sire Forest Camp (by Deputy Minister) and Grade 3 winner Spanish Empire (by Pleasant Colony). Second dam Classy Craft was a stakes winning juvenile. This distaff family has produced multiple graded stakes winners Jambalaya Jazz, Steal a Kiss and Love You By Heart. Mission Impazible’s damsire Hold Your Peace (Speak John – Blue Moon, by Eight Thirty) is rarely found so close up in pedigrees since the bay stallion was foaled in 1969. He is a direct descendant of the great stamina influence, Princequillo. Hold Your Peace was a winner from six to nine furlongs and at two, he won the Arlington Washington Futurity. Pointed to the Kentucky Derby trail, Hold Your Peace was second in the Everglades (seven furlongs) and Bahamas Stakes (1 1/8 miles) then won the 1 1/8 mile Flamingo Stakes by ten lengths. He finished third in the Kentucky Derby behind champion Riva Ridge. Hold Your Peace entered the starting gate 39 times and crossed under the wire first in 11 of those races. At stud, Hold Your Peace stood at the famous Tartan Farms in Florida. His best and most important son is undoubtedly Meadowlake, who, like his sire, won the Arlington Washington Futurity and continued on to become a prominent sire in his own right. Although Meadowlake is deceased, his sons carry one of the few male strains of Princequillo left in the United States. Hold Your Peace is the damsire of 14 stakes winners, including Grade 1 winners French Deputy and Peace Rules, who emulated Hold Your Peace by finishing third in the Kentucky Derby. Peace Rules was a determined fighter on the racetrack. His best distance was up to 1 1/8 miles, but he did win the Suburban Handicap (G-1) at 1 ¼ miles when he was four. Peace Rules is the only progeny from a Hold Your Peace broodmare to win at the classic distance. Incidentally, Peace Rules and Mission Impazible are both descended from the Mr. Prospector sire line. Mission Impazible has similar breeding to Unbridled Energy (Unbridled’s Song - Atae, by Hold Your Peace) a Grade 2 winner at 1 1/16 miles. Additionally Mission Impazible is bred along the same lines as last year’s Kentucky Derby contender, Old Fashioned as both are by Unbridled’s Song and Old Fashioned’s dam is by Hold Your Peace’s son, Meadowlake. Delving further back into his pedigree, Mission Impazible carries the bloodlines of Drone, the damsire of Kentucky Derby winners Grindstone and Charismatic, through his lesser known son Crafty Drone, Mission Impazible’s second damsire. Crafty Drone was a remarkable racehorse, winning stakes races from 5 ½ furlongs to 1 ¼ miles. Going back a little further, Mission Impazible’s third damsire Outing Class won from 6 ½ furlongs to 1 ¼ miles and Outing Class is descended from the great broodmare Iron Maiden. While not as prevalent as closer relations, these additional stamina influences may help Mission Impazible in his Derby quest. Now that we’ve uncovered the facts in Mission Impazible’s pedigree, we’ve discovered that his chances on paper for successfully negotiating the 1 ¼ mile Kentucky Derby are borderline. While other bloodlines in his background may help and his sire has effectively produced ten furlong winners, Mission Impazible’s damsire has only one winner at this distance to his credit. Additionally, the cleverly named son of La Paz is very lightly raced and his pace pressing running style may hinder him in a Derby shaping up with a lot of speed. To his credit, the hard running colt handled the crowded conditions of the Louisiana Derby well and he galloped out strong at the end, indicating he may give a good performance in the big dance. Find more great Pedigree Analysis and Derby coverage at Iron Maidens Thoroughbreds. Until each and every three year old enters and runs a 9 frulong race, you will not have a handle of what will happen the first Satruday in May..I would also discount the syntogarbage races. Agree that the jury is still out on Mission Impazible. Many people want to knock Mission Impazible's stamina capabilities and they usually try to do it through his dam, using Forest Camp as the example. What many people fail to realize is that Forest Camp is the ONLY one of La Paz's seven winners who failed to win a race at one mile or farther. MI's other graded stakes winning half brother, Spanish Empire, won going 10 furlongs in Allowance company and competed in 10 furlong stakes races. I agree that pedigree is not the only determination of a Derby winner, but it is one tool among many that can help separate the pretenders from the contenders. A horses heart, temperament, conformation, soundness and training regimen, and how well the jockey fits the horse all play an important part. Then there's that little thing called luck. many WINNERS suppossedly did not have the pedigree. What the individual does, an NOTHING ELSE determines if they can win.